There is only one reason why I go back to visit TED each year. No, it is not to learn about the latest global innovations or bump into (other!) famous people over lunch (This year’s list included Monica Lewinsky and Steven Spielberg by the way, but who’s counting?). I go simply to be inspired by one of the most inspiring bunch of people that come together on one stage year after year – the TED Fellows. Together, we have our own little private ‘thinkathon’ parallel to the main TED conference and honestly, we have the most fun among ourselves – attending a private circus-training course or fish-gazing at the aquarium. On any given day in Vancouver this time, my breakfast companions might have included folks like Burçin Mutlu-Pakdil, a Turkish astrophysicist who actually has a double-ringed elliptical galaxy named after her, or Faith Osier, an infectious disease doctor from Kenya who is currently translating her malaria research into new vaccines that will save millions of lives. I was particularly moved while listening to psychiatrist Essam Daod, the first Palestinian citizen of Israel to become a TED Fellow in 2018. Essam, who is a big fan of India and Bollywood, grew up in a small Arab village in the Galilee, and currently stays in Haifa. He is a trained child psychiatrist and psychotherapist. He told us about how he travelled to Greece in November 2015 to provide psychosocial support to Syrian refugees who were landing there by the boatload – this was at the peak of the refugee crisis in Europe. However, a few hours after reaching, he was literally in the water, unsuccessfully trying to revive a dead Iraqi lady. 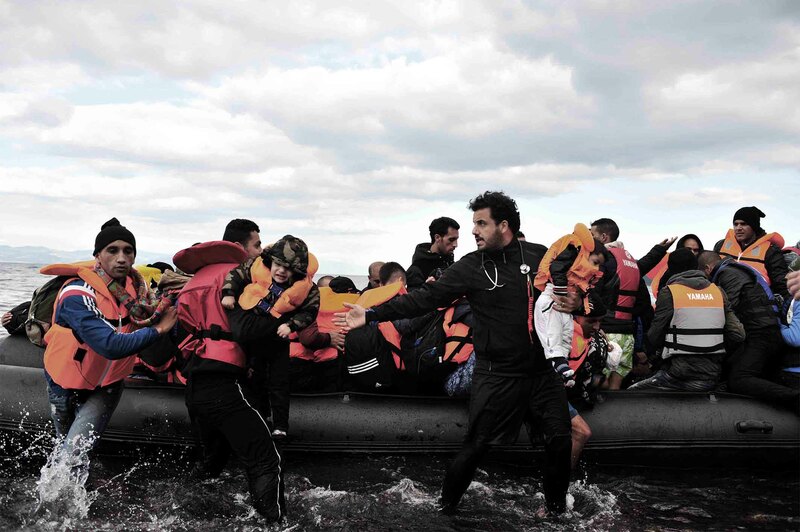 Essam Daod in the middle of a Humanity Crew refugee rescue. He told us about how he went through the routine of providing CPR to her even though he knew she was dead simply because her family had been waiting for around four hours for a doctor, and they would not have been able to accept it if he had told them right away that she was dead. Essam realised from his experiences early on that mental health needs to be at the forefront of humanitarian aid, next to other basic needs like water, food and shelter. So three months later, in his small flat in Haifa, he and his wife started their own humanitarian aid organisation, Humanity Crew. This is one of the very few organisations that provides mental health and psychosocial support to refugees and displaced populations in their own language. People who are on refugee boats see so much horror before leaving their homes and also during the difficult journeys they take. And when the boats land, they face an uncertain future. It is not as if the countries they reach on the boats are waiting with open arms to welcome them. In the midst of all the turmoil, folks like Essam are trying their best to ease their suffering. In a world where our political leaders are trying to divide us all the time, I am so grateful that people like Essam exist, as beacons of hope. Let me tell you about another beacon of hope – Divyanshu Ganatra, who I met in Mumbai, right after coming back from Vancouver. After losing his eyesight at the age of 19, Divyanshu got a lot of free advice from well-meaning people about what a blind person should and should not do. He paid no attention to it thankfully and has over the years raked up an impressive list of firsts: India’s first blind solo pilot and the first blind tandem cyclist to complete the more-than-500-kilometre-long ride from Manali to Khardung La, to list just two. Now he has started Adventures Beyond Barriers Foundation, a non-profit that promotes inclusivity for people with disabilities through adventure sports. Yes – other worlds are indeed possible. Reach out to this foundation and ask their team to take you on a ride or a flight with someone who is disabled. The experience will really open your own eyes. Other worlds are also possible in terms of fundraising and the arts. Those of us who are involved in the arts in India are constantly lamenting government apathy, lack of funds and so on. However, my friends at Junoon – Sameera Iyengar and Sanjana Kapoor– are creating a new paradigm for art patronage with their Junoon Salons model. Both of them ran Prithvi excellently for many years, and they have since then been serving our country wonderfully with Junoon’s extraordinary free public programming. Now, they are trying to fundraise for all the wonderful things they have planned for Junoon’s future. Junoon Salons is an exclusive patronage programme. For an annual fee of just over a lakh (which is less than what that Gucci bag you’re eyeing costs, haan! ), you can get an exclusive chance to attend three very private salons, each of which comprises an intimate performance, dinner, drinks and conversation. I was delighted with the first salon I attended. I saw a special puppetry show by Katkatha, a puppet theatre group based out of Jaitpur village which is near Delhi. It was good to see loads of evolved patrons in the audience – folks like Aditi Kothari Desai, Bharat and Vidya Doshi, and Naseeruddin and Ratna Pathak Shah, for instance. 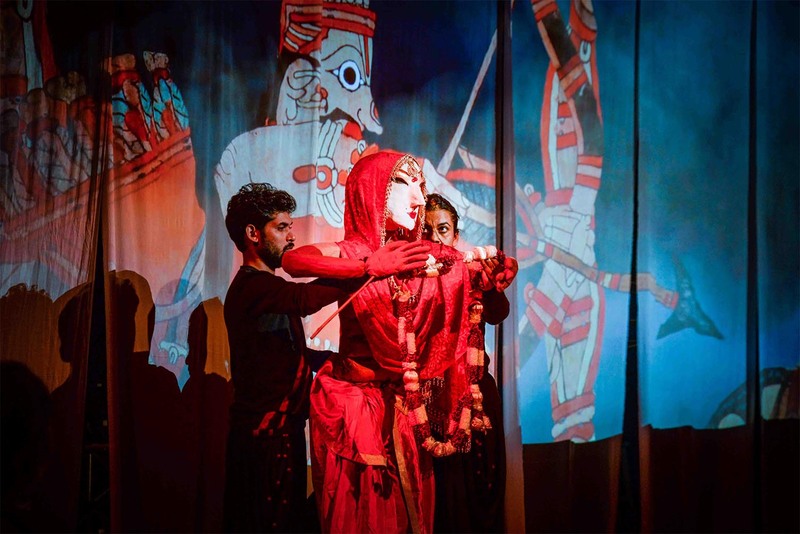 The Katkatha team had created a collaborative retelling of the Mahabharata by fusing the 500-year-old Japanese Bunraku puppetry that they have perfected with the traditional style of the Indian master puppeteer Gunduraju. I saw life-sized forms of Draupadi, Bhishma and other characters come to life. When the show ended, I realised I had tears in my eyes. The Katkatha Mahabharata performance at a Junoon Salon.